I was using Xubuntu 11.10 when I was trying this. To get a list of the devices on th PC run fdisk, sudo fdisk -l.
If you are lucky then it will detect the disk. In my case, the OS didn't detect it. So I tried sudo lshw -C disk -short and cat /proc/partitions to get the name of the device. 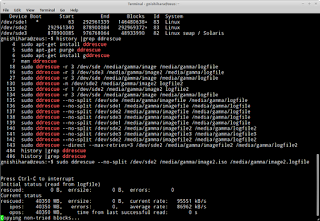 Then, I used ddrescue (package name is gddrescue) to image the file. I did this by first running ddrescue --no-split /dev/sdd1 / media/gamma/image /media/gamma/image.logfile, then by trying ddrescue -r 3 /dev/sdd1 /media/gamma/image /media/gamma/image.logfile to try to squeeze every bit of data out of the drive.